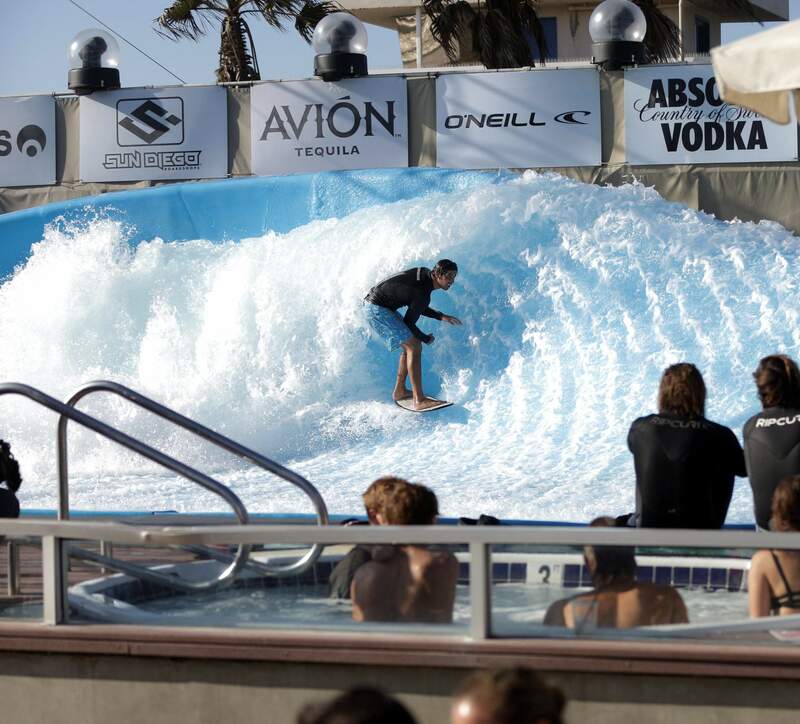 A surfer rides the machine-made wave at Wavehouse San Diego. Surf parks could open up the sport to large new markets far from coastlines. Sammantha Aker of Huntington Beach, Calif., rides a machine-made wave at Wavehouse San Diego. Industry officials say surf parks could create a standardized way to train and gain surfing a place in the Olympics. To be profitable, surf parks need to be the centerpiece of a larger development in a large population center, says Tom Lochtefeld, owner of Wave Loch, a wave technology company. Some of surfing’s biggest names aren’t just catching waves. They’re also talking about making them. Surf parks – massive pools with repeating, artificial waves – are the latest buzzword in the surf community, as everyone from top athletes to retailers looks for ways to expand the sport, boost sales and create a standardized way to train that could help surfing earn an Olympic pedigree. “Mother Nature stipulates that surfing only can occur where waves can be born. When man takes his hand to forming the waves, it unlocks the potential of surfing anywhere. And that is the most powerful thing,” said Doug Palladini, president of the Surf Industry Manufacturers Association. This month, dozens of industry leaders, surfers and investors met in Laguna Beach in Southern California for the first annual Surf Park Summit to spark interest in a business proposition that could breathe life into a sport that struggled during the recession. About 50 percent of independent, mom-and-pop surf retailers – the heart and soul of surf culture – shut down worldwide during the recession and those that survived face an increasingly saturated market that is limited by geography. Enter the dream surf park, a 2-acre wave pool capable of generating anything from tiny beginner ripples to 10-foot barrels every minute, with every wave the same. Customers would pay by the number of waves to learn the sport or refine their technique and learn new tricks. The prospect has surf board manufacturers and apparel retailers salivating at the thought of new markets for surf gear and clothing in land-locked places such as Colorado or Kansas. But parks also would be prime real estate for sponsored surfing competitions that would draw both eyeballs and dollars. At the summit, speakers tossed out tantalizing what-ifs: a national surfing league, much like the NBA, with feeder teams and city affiliations; live, televised surfing competitions staged with predictable waves in a massive surf arena. Some even believe surf parks could propel the sport into the Olympics, a dream that so far has proven elusive. Olympics aside, everyday surfers who already live near the beach say even they would use the parks as a supplement to the ocean to refine their skills on a consistent wave or get in a few rides when the natural surf is bad. “In a park, you can always get in a perfect position, the wave will always be perfect and you can really work on your surfing,” said Cliff Char, 54, who’s been surfing 15 years near his hometown of Seal Beach. Detractors, however, worry that in the rush to surf parks, the sport will lose its soul. Betting on artificial waves, they say, will sanitize and commercialize a pastime the most passionate surfers describe as a solitary, rugged pursuit where athletes and nature commune. They say the sport will lose sight of its culture and history if the next generation learns to rip on chlorinated water. Others are concerned that the energy required to power waves big enough for surf parks will contribute to global warming. Momentum around surf parks has been growing since the 1960s, but fewer than a dozen serious parks currently exist in locations from Florida to Malaysia – and cost and wave technology always have been stumbling blocks. That technology now has advanced enough to make parks economically viable, but operators will need to build near large population centers and make the pool the centerpiece of a larger development to make a profit, said Tom Lochtefeld, owner of Wave Loch, a wave technology company. Some of the biggest and best-known include Disney’s Typhoon Lagoon in Florida, Wadi Adventure in United Arab Emirates and Wavegarden, a private research and development site tucked away in Spain’s Basque country. A park that would attract serious surfers would run between $15 and $25 million to build and need to be at least 2 acres in size to allow surfers to paddle in, Lochtefeld said. With current technology, the energy price tag for one hour of waves could be up to about $500, he said. Other wave companies have said they can produce waves for $1 a wave, said Matt Reilly, director of operations and marketing at Surf Park Central, which put on the summit. “It comes in as how you operate a park, and that’s a question that hasn’t been answered by anybody,” he said. Despite the challenges, history is filled with examples of extreme, outdoor sports that have been tamed for the masses. Before chair lifts, ski bums had to hike up mountains to ride down and rock gyms made rock-climbing possible miles from any mountain, said Dan Harmon, a development manager with Select Contracts, which builds and operates leisure and sport projects worldwide.